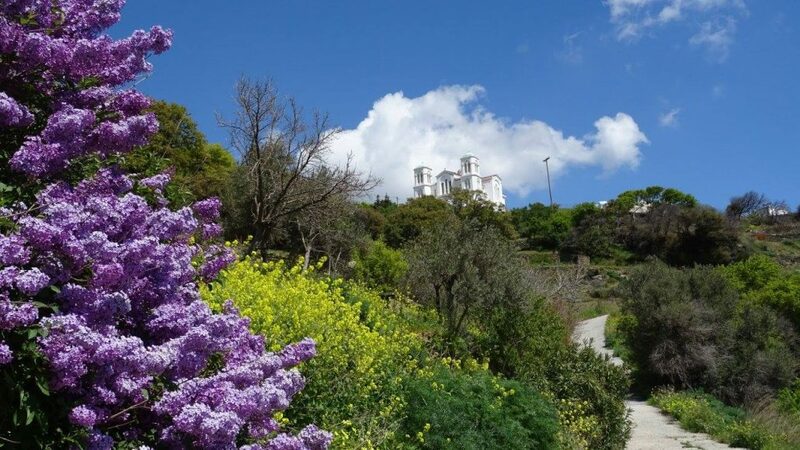 These days it is primarily nature in Andros which steals one’s heart…how can one describe the unbelievable range of colours and hues of green, the colours of the flowers, the blue of the sky, the smell of the orange and lemon trees in full bloom, the wildflowers, the crystal clear waters flowing everywhere… How can one fail to be in awe of the wonderful, centuries-old, work of Andros’s farmers carved into the scenery… drystone walls, threshing floors, farmers’ bothies, chapels…how lucky we are to live here, if only we would realise..! 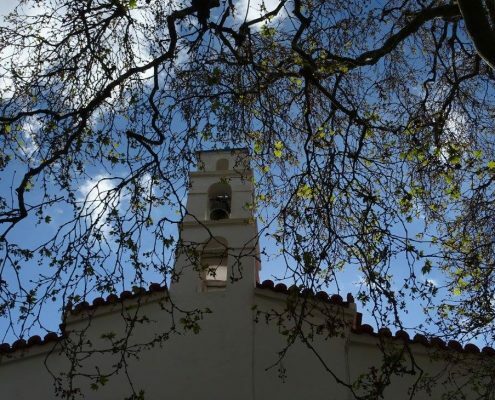 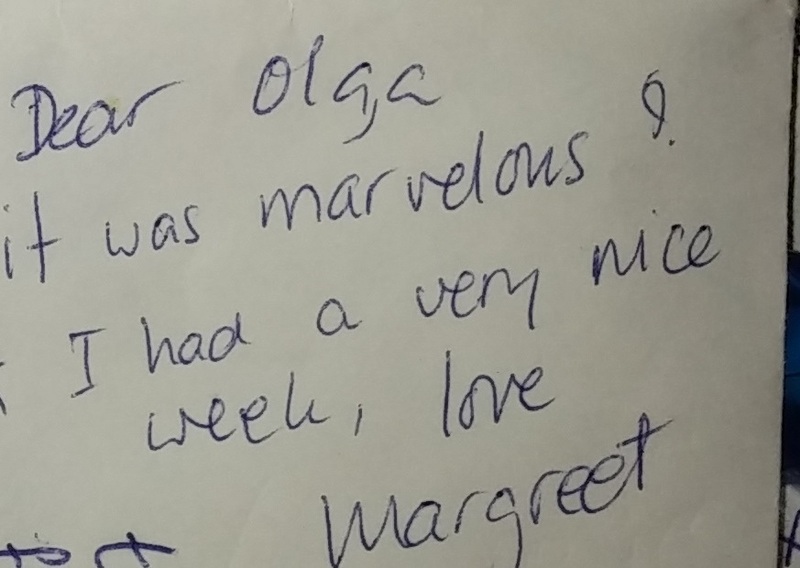 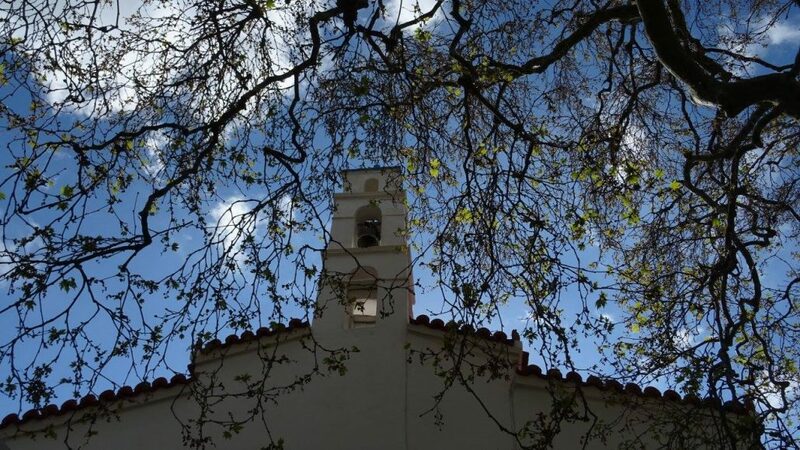 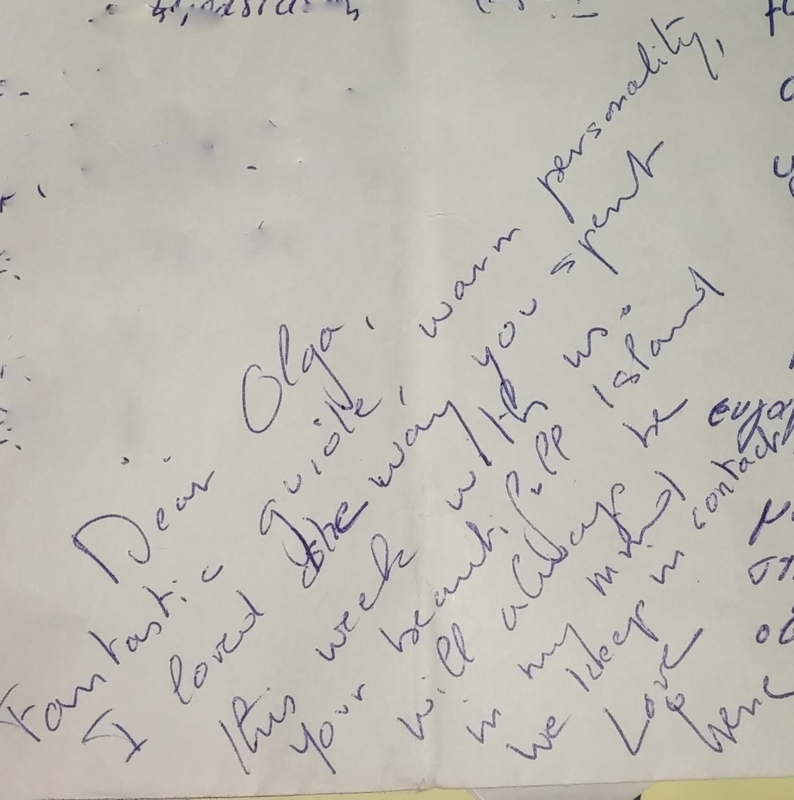 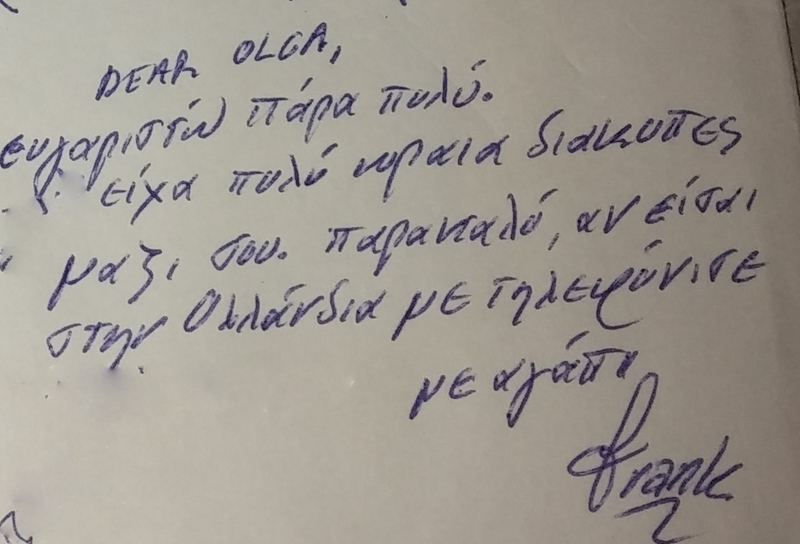 Perhaps the least I can do is provide a brief narrative of each day, although my friend Vangelis Loukisas has already recounted every day of the journey. 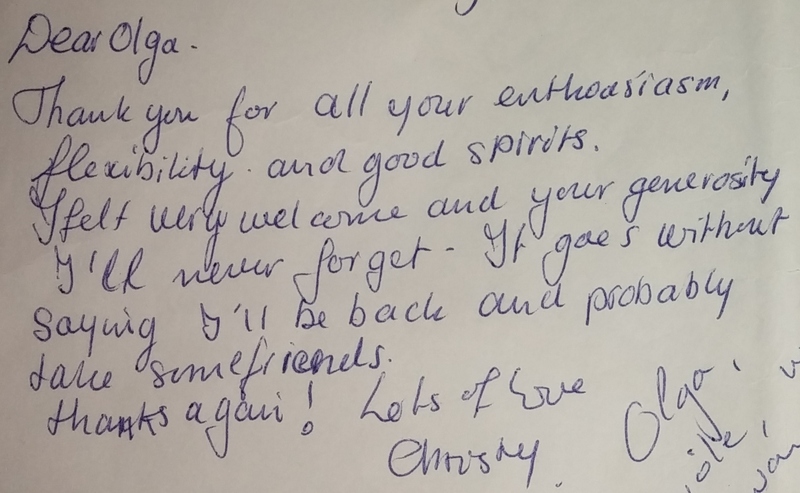 However, looking back, reflecting on the whole experience has its own merit. So, in short…10-12 people worked for 7 days on the Andros trails offering, by a modest estimate, 55 days of work. 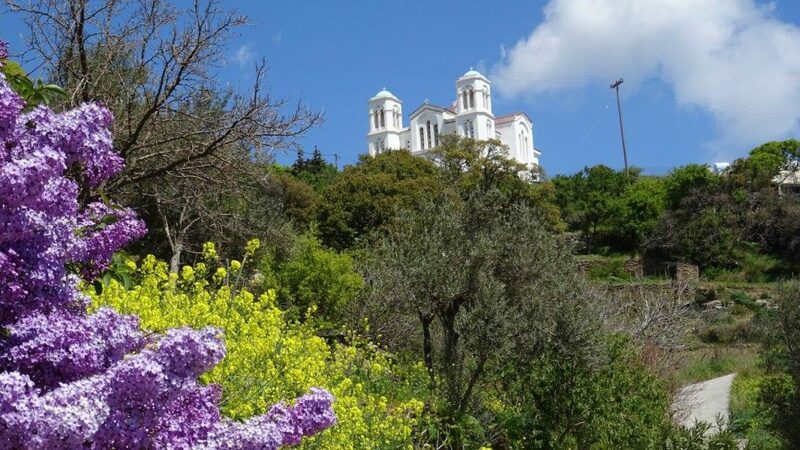 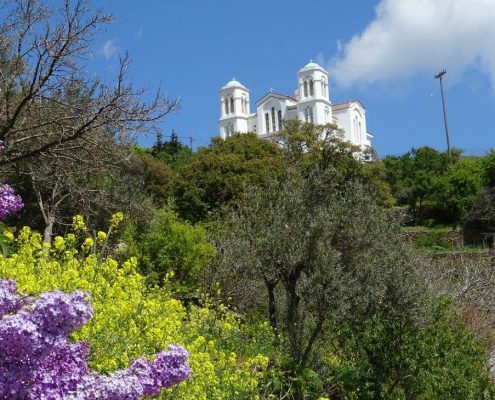 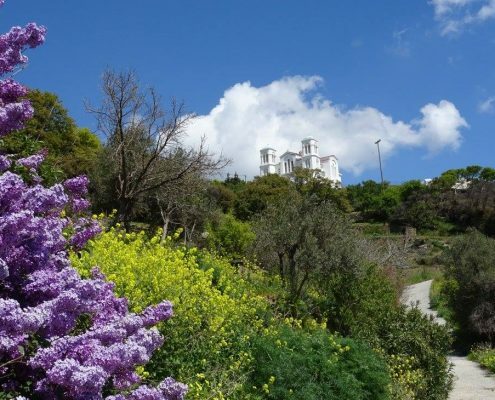 We worked in Gavrio and Ano Gavrio (route 14), in Katakilos (routes 11 & 2 round tours of Katakilos), in Menites, Lamyra, Ypsilou, Niborio (route 1), in the Achla valley, from Vourkoti to the St. Nicholas Monastery (route 6), in the valley of the Great River from the Panachrandou Monastery till Falika and Aladinou (routes 1 & 18), in Piso Meria, from the Tromarchia Monastery till Amonakliou and Aidonia (route 4), in the areas of Exo and Mesa Vouni, in Gianniseo, Lardia, Rogo till Korthi Bay (route 5). 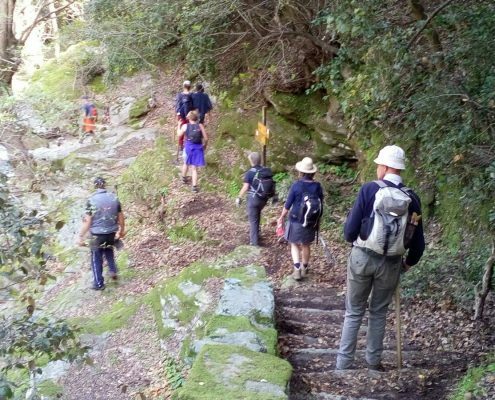 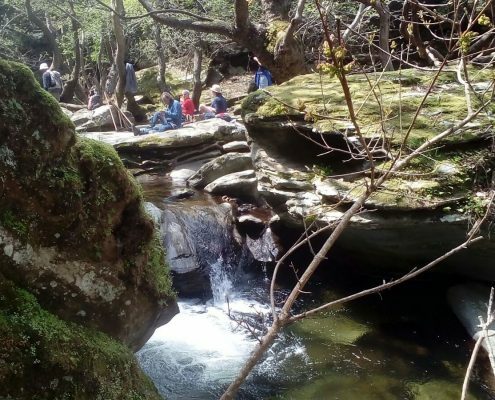 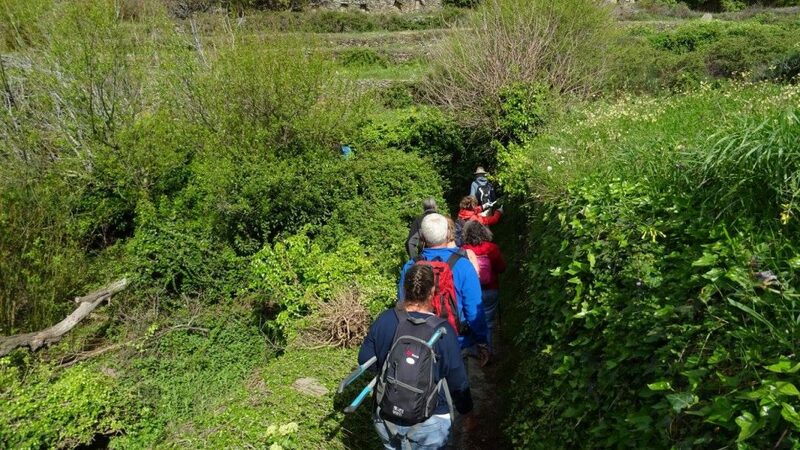 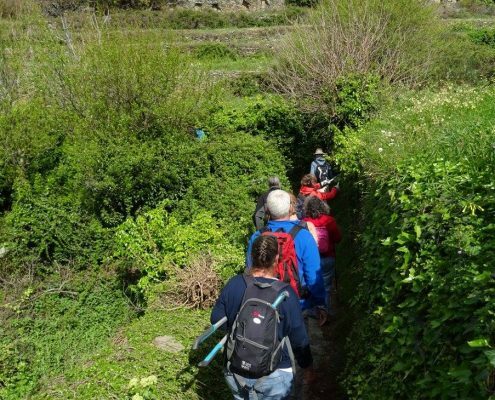 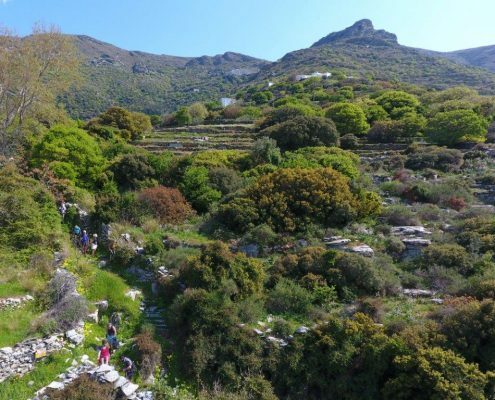 We cleaned the trails using secateurs, hoes, and loppers, limiting excessive greenery, improving the accessibility of trouble spots damaged by an excess of water from springs, we built steps in remote areas and collected a considerable amount of garbage. 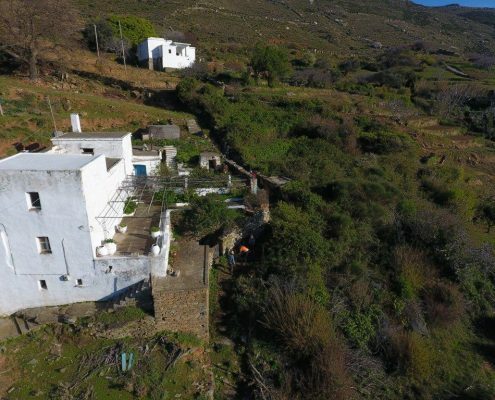 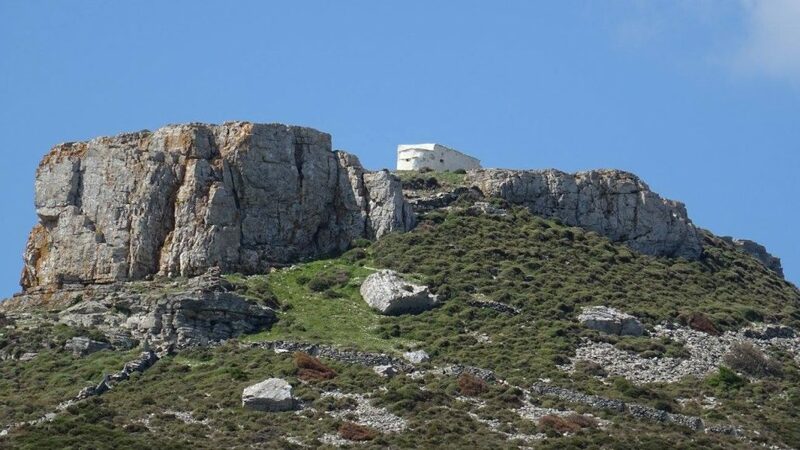 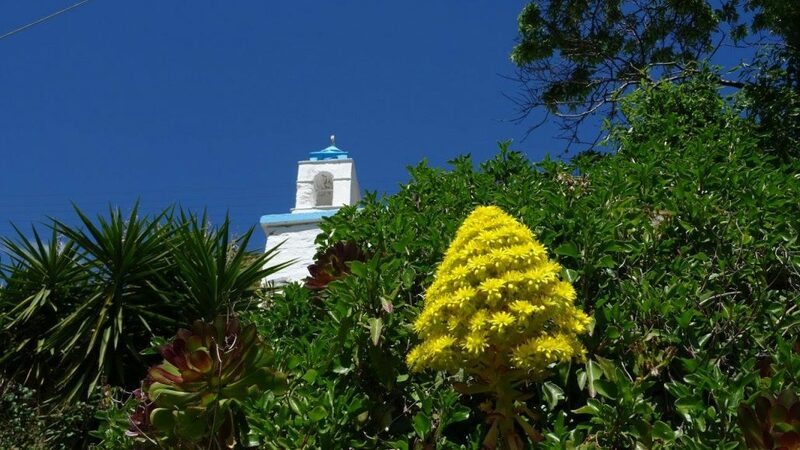 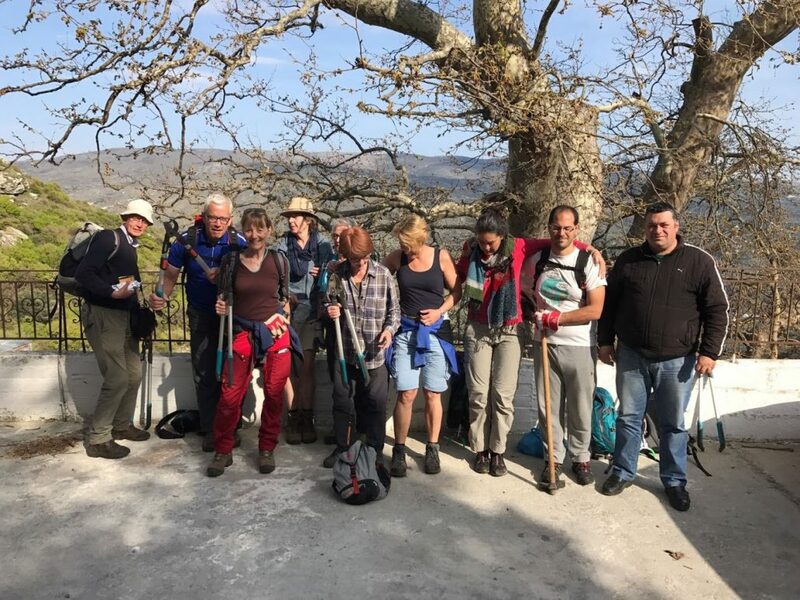 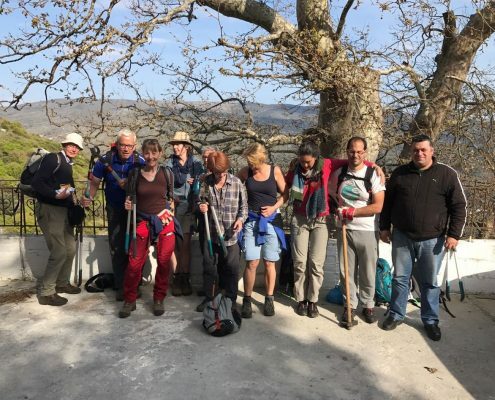 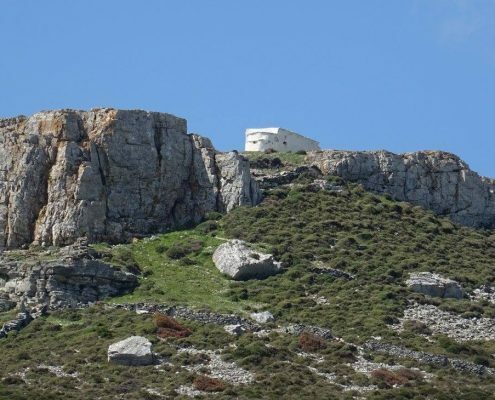 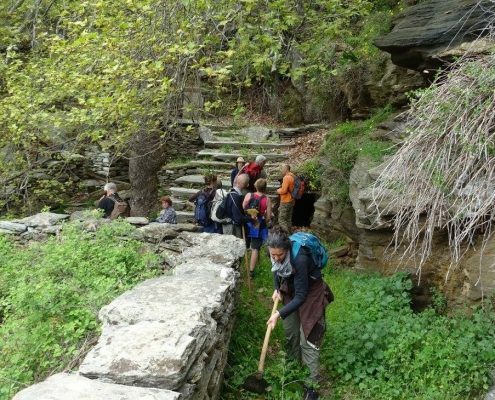 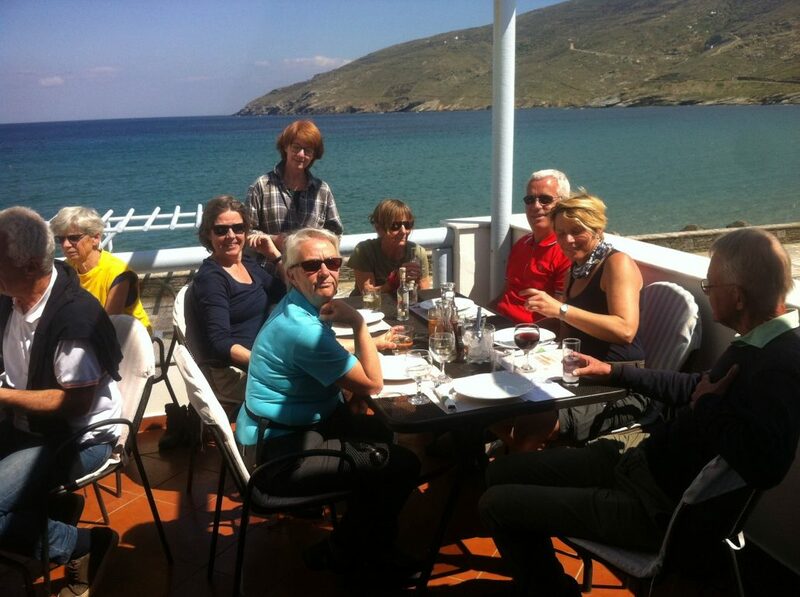 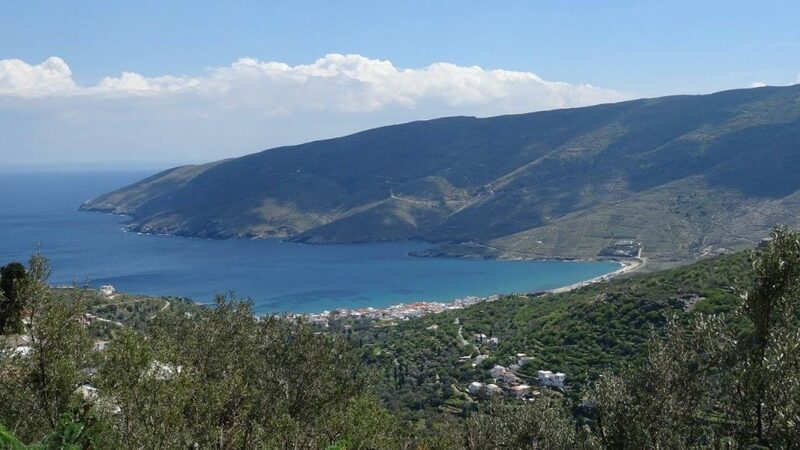 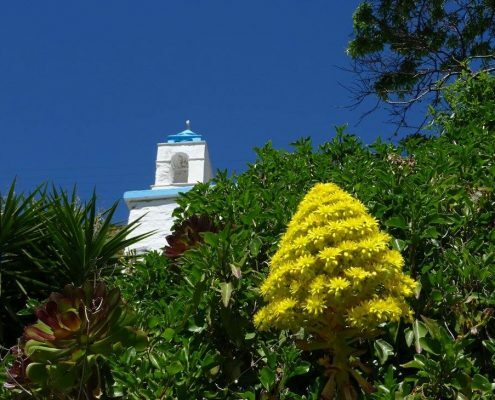 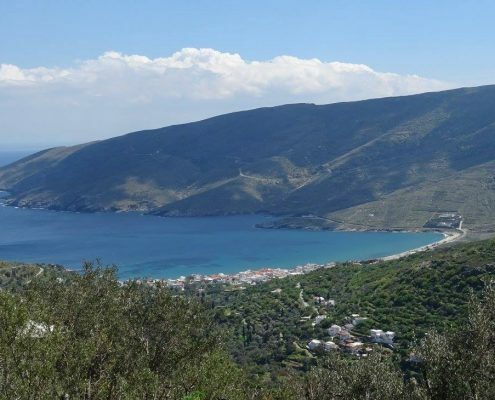 The Municipality of Andros assisted us on 7 of the 8 days and Nikos Mandarakas, Dimitris Laskaris, and Dimitris Hazapis were excellent guides to us. 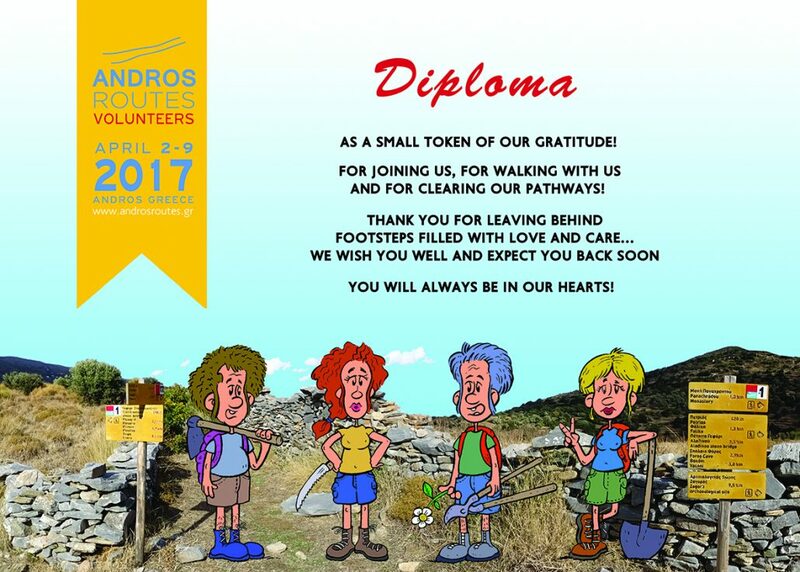 We extend our sincere thanks to them. 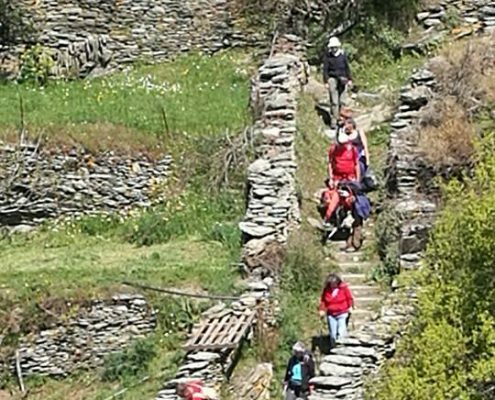 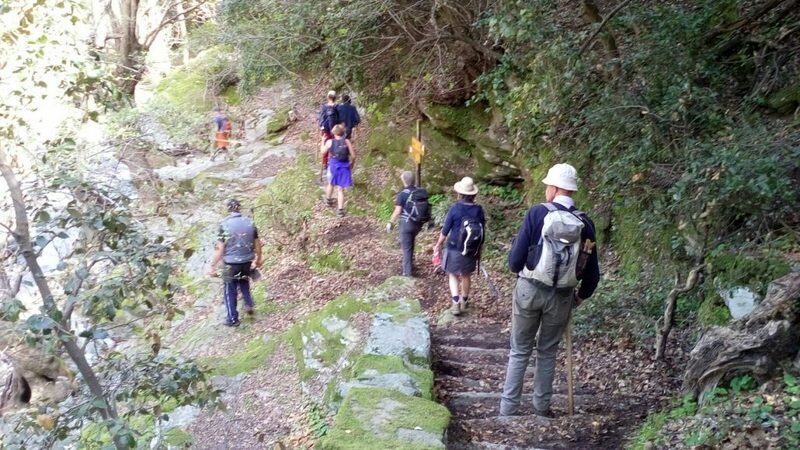 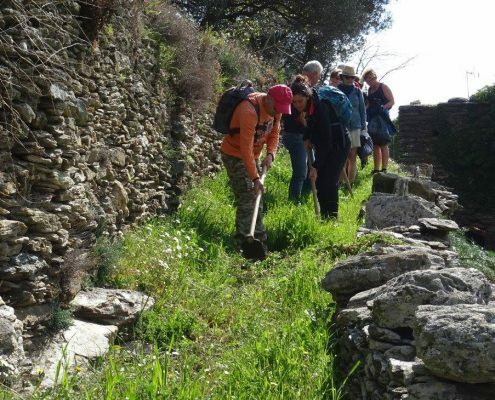 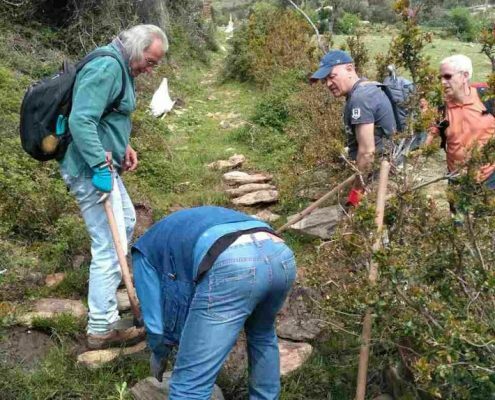 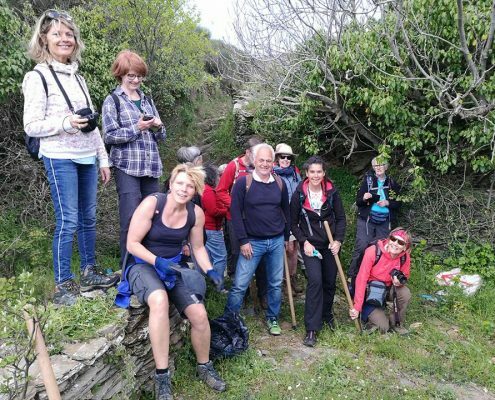 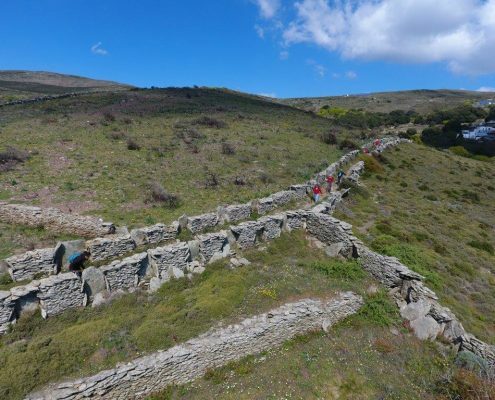 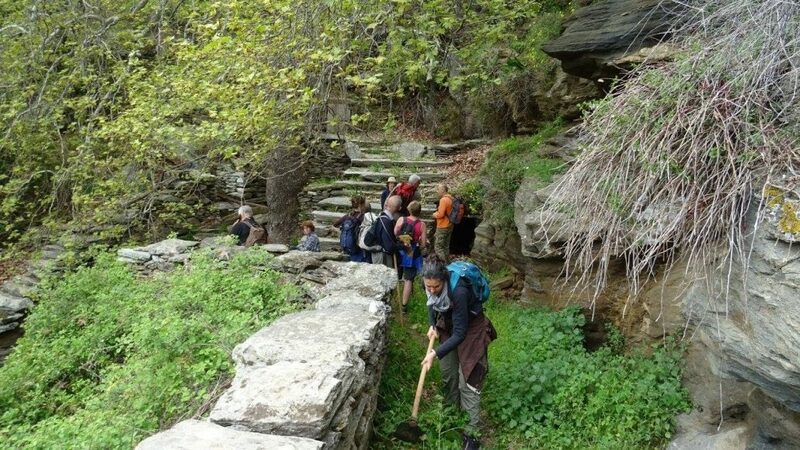 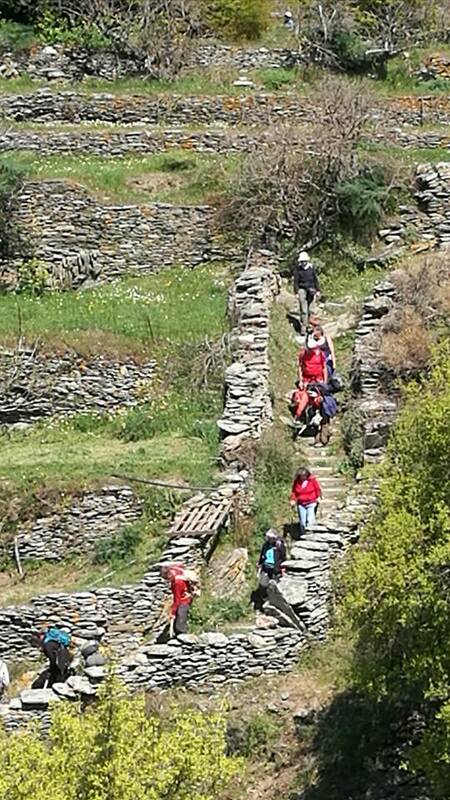 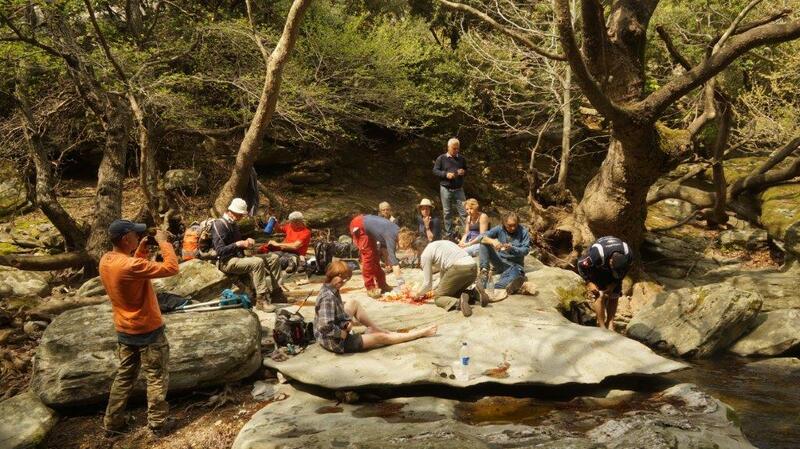 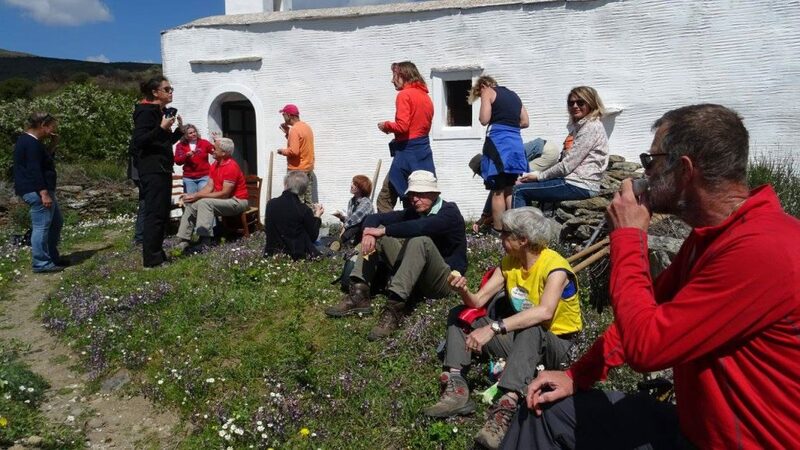 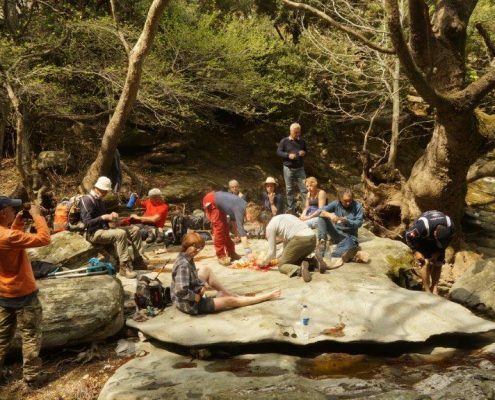 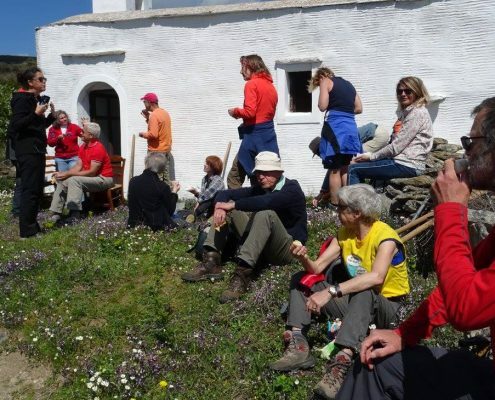 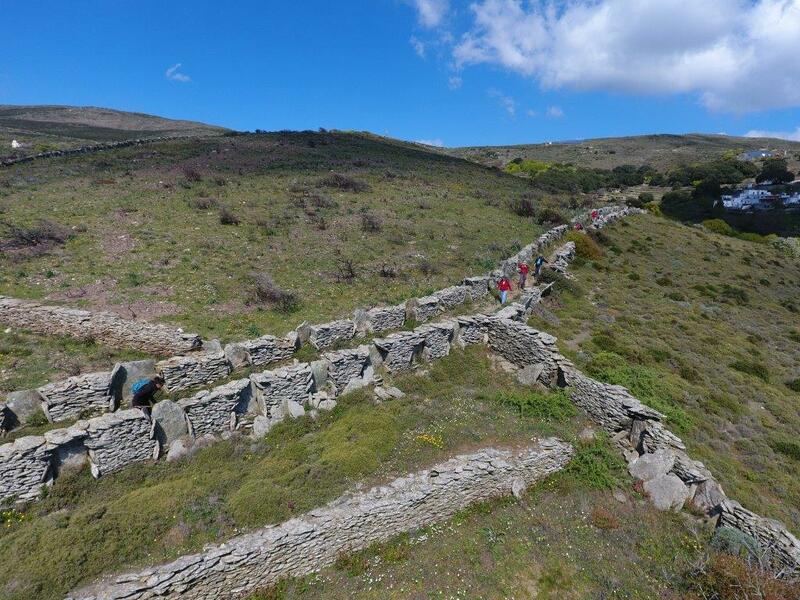 Several Andros Routes volunteers worked side by side with the Dutch volunteers in cleaning the trails. 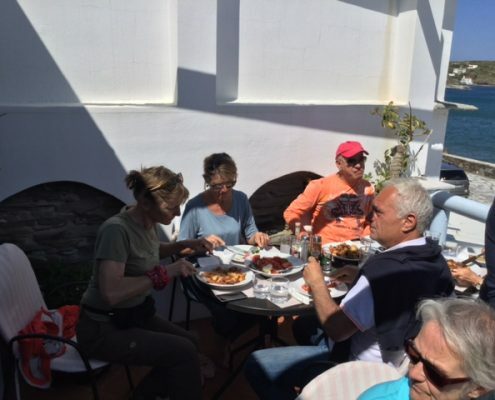 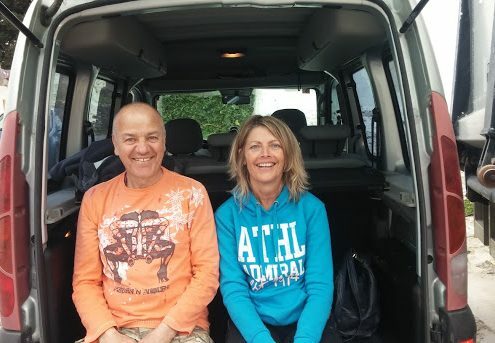 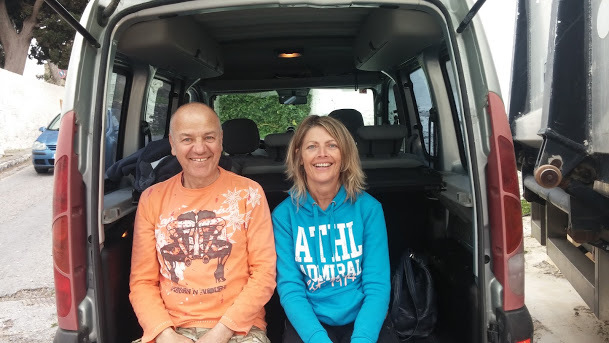 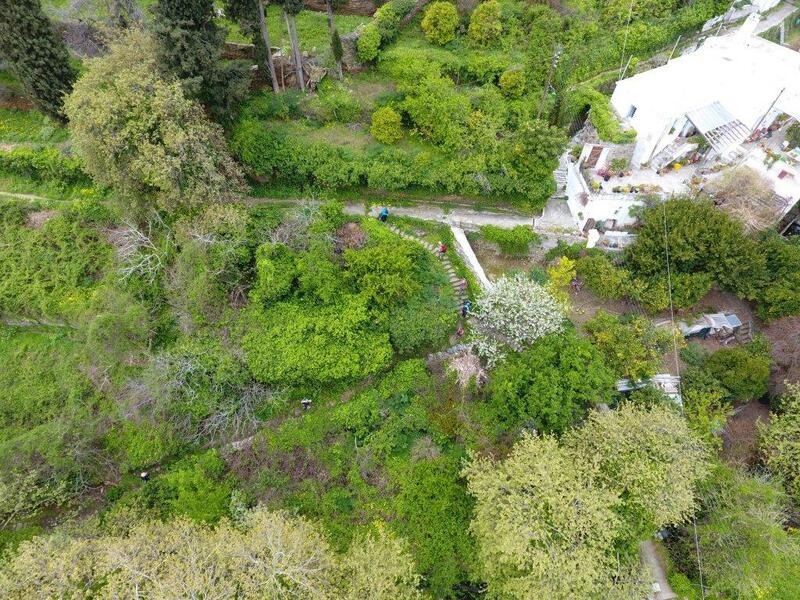 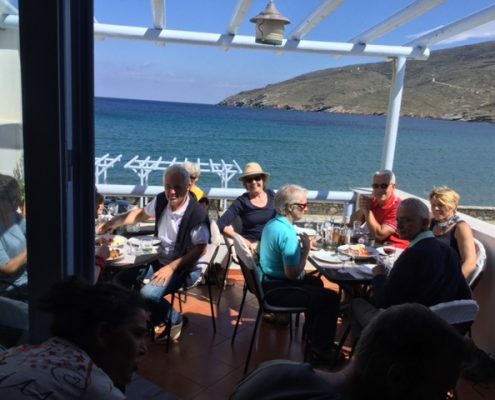 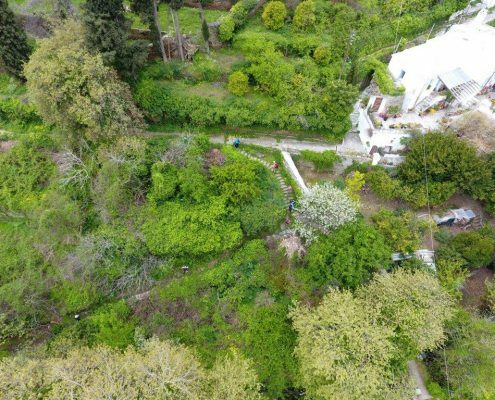 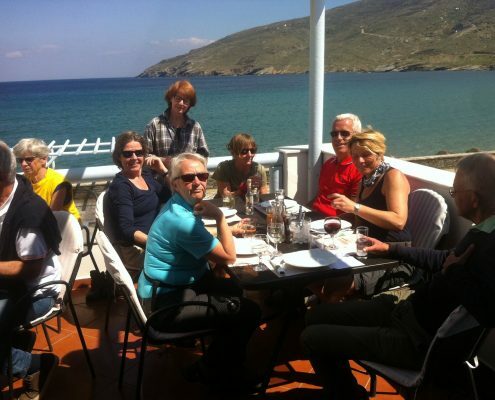 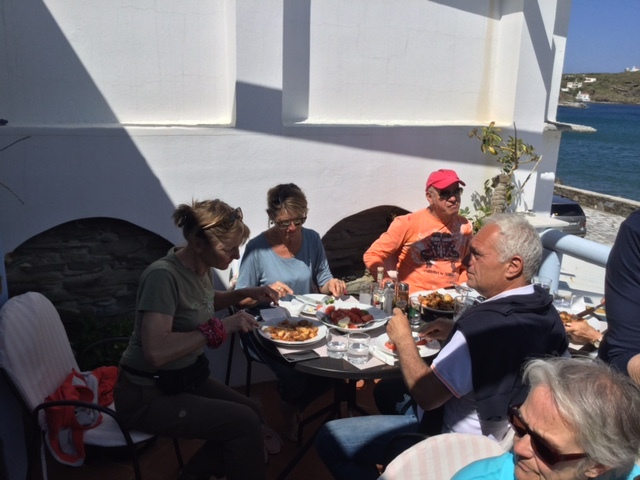 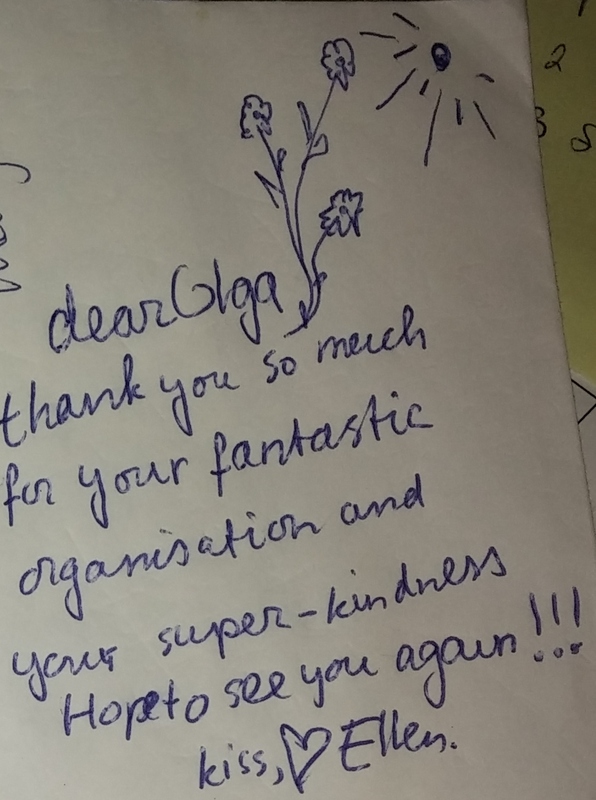 Leandros Petrakis, Nikos Paraskevopoulos, Joseph Papadopoulos, Ineke van Lint, Ulli Sthalman and Olga Karayianni were the regulars, while Richard Gillespie flew from England in order to also help us. 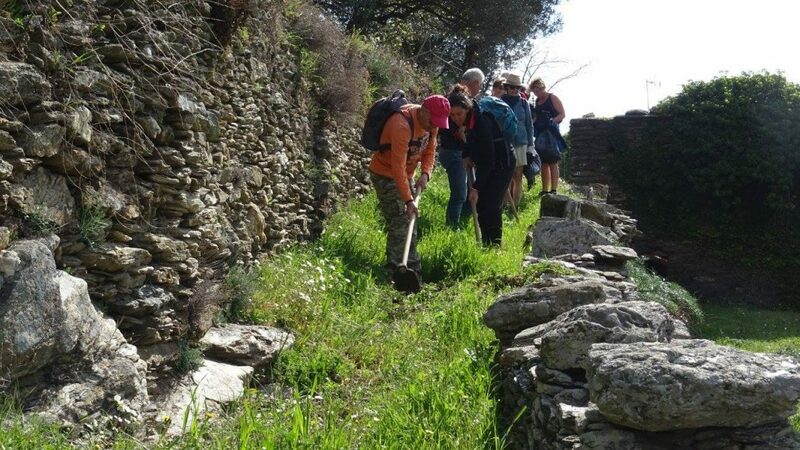 Nikos Avgoustis, Erietta Papaioannou, and Panos Georgiou escorted the volunteers in their work at Korthi. 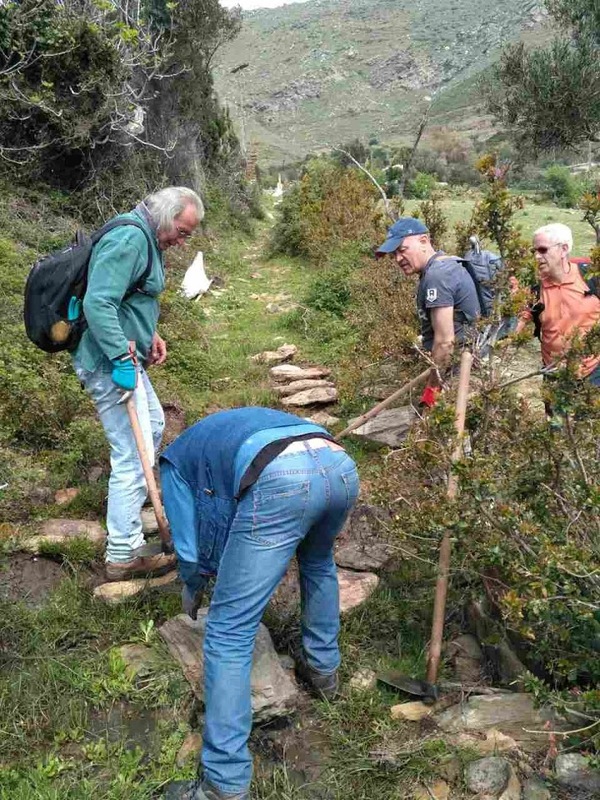 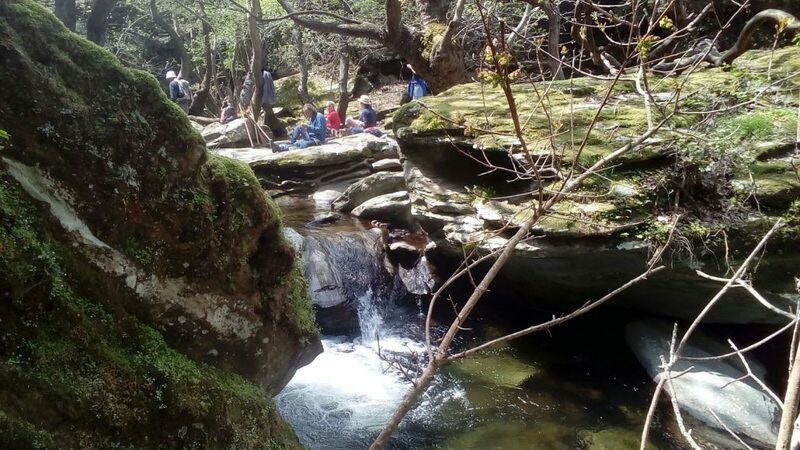 Workers Stathis Manesis and Yiannis Vartholomeos also helped in cleaning the trails. 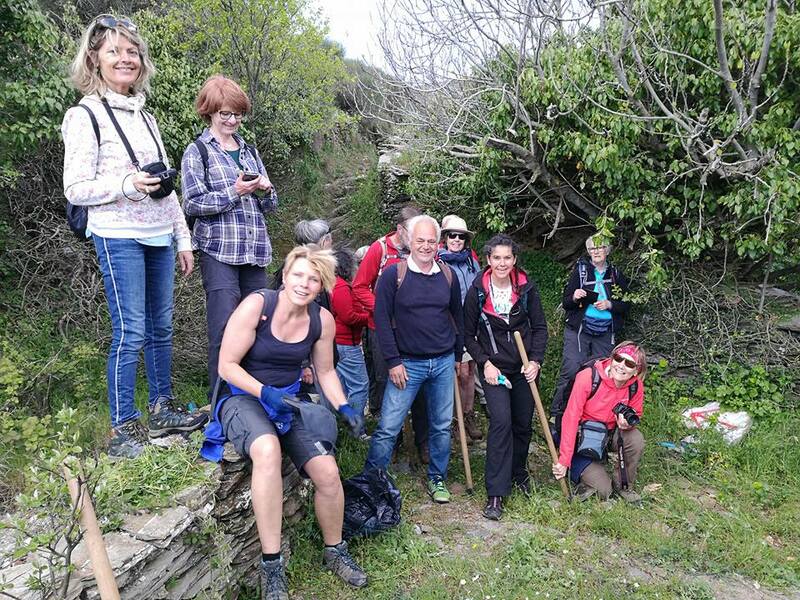 May they always be strong and eager to work to keep the island’s trails alive! 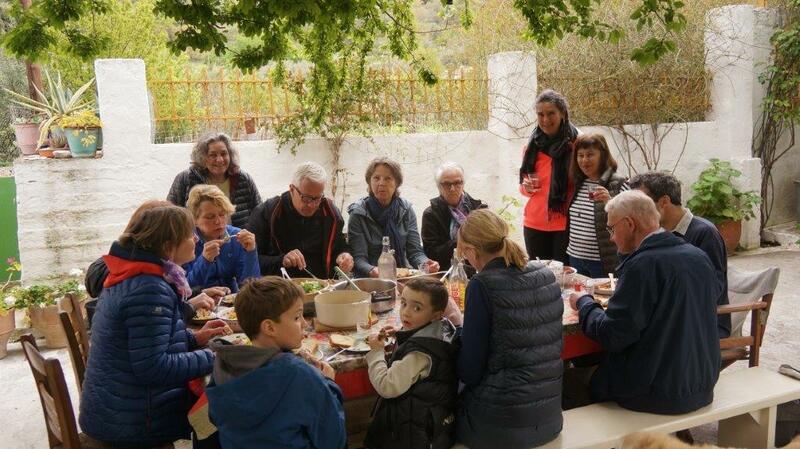 Nikos and Lia Avgousti with the help of Erietta and Panos Georgiou and Joyas Mill in cooking the meat offered by the Tridimas butcher shop in Gavrio. 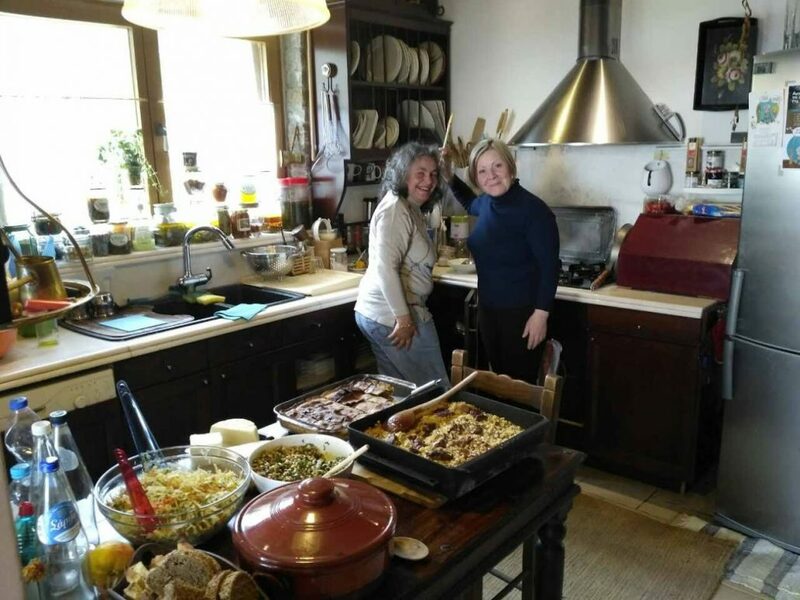 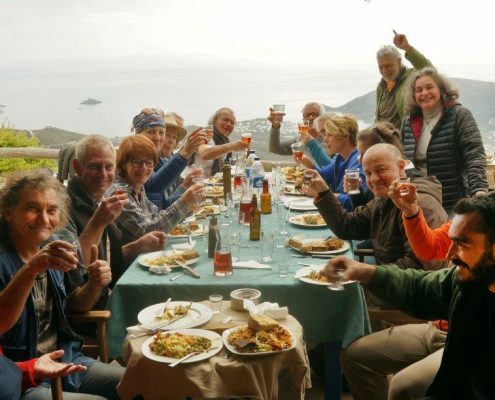 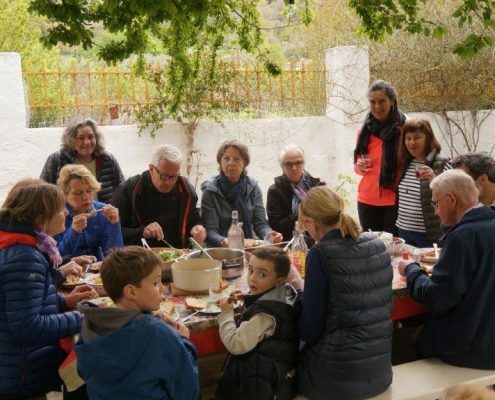 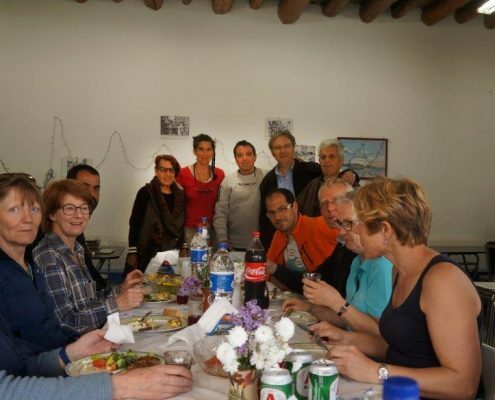 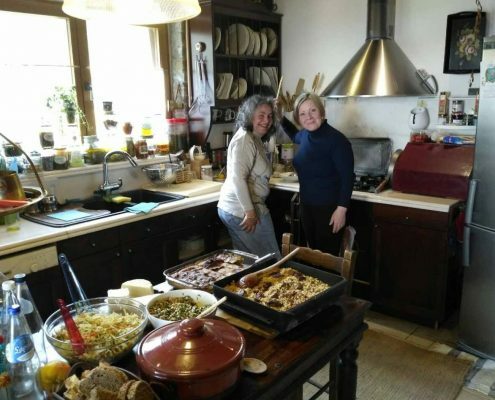 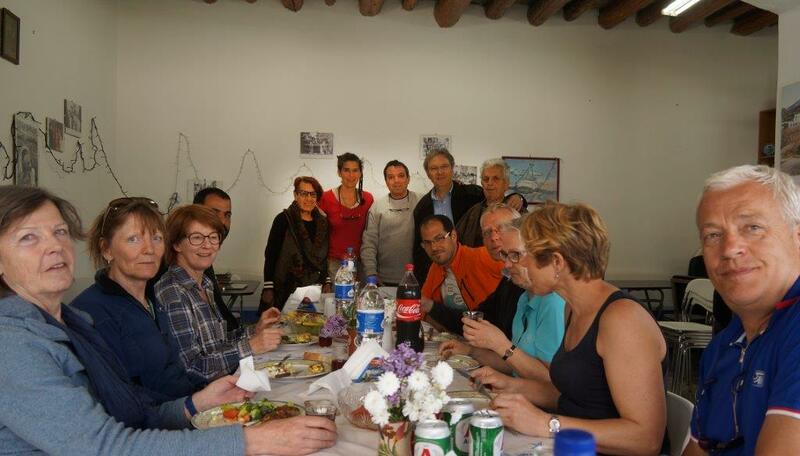 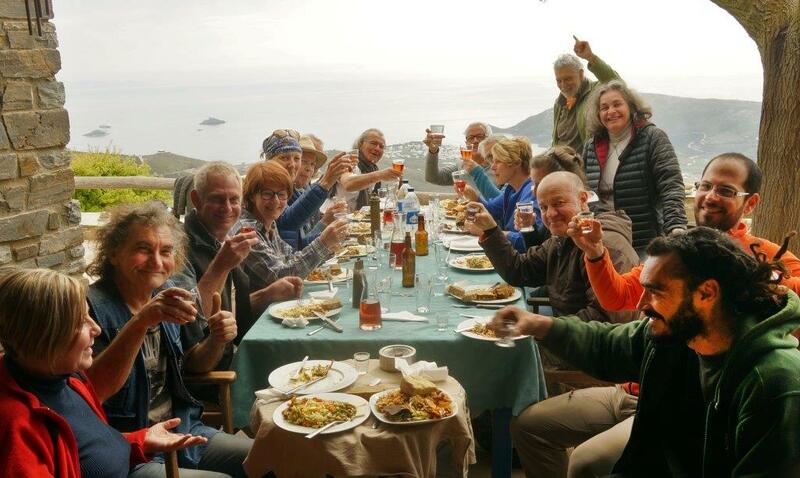 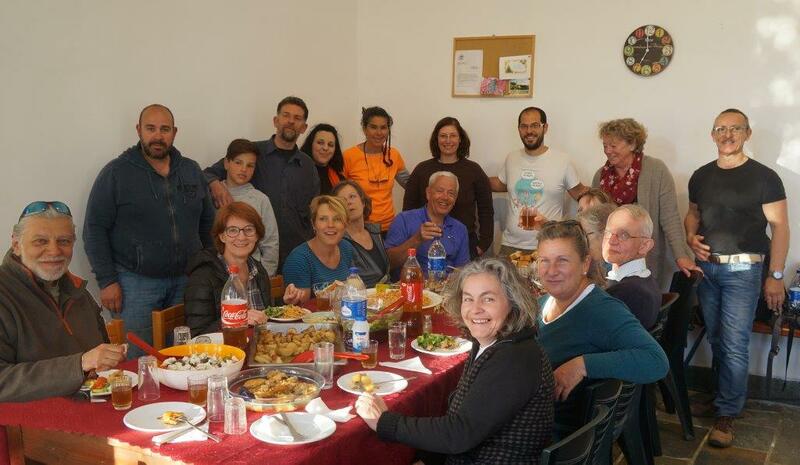 Their skill and warm hospitality made for a delicious meal offered to the volunteers on their second day of work in Ano Gavrio. The Eftychia café who also wanted to treat the Dutch volunteers to drinks on the last day, despite the fact that we were not able to take them up on their offer for lack of time! 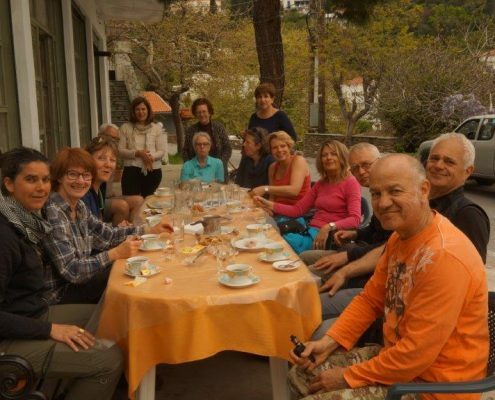 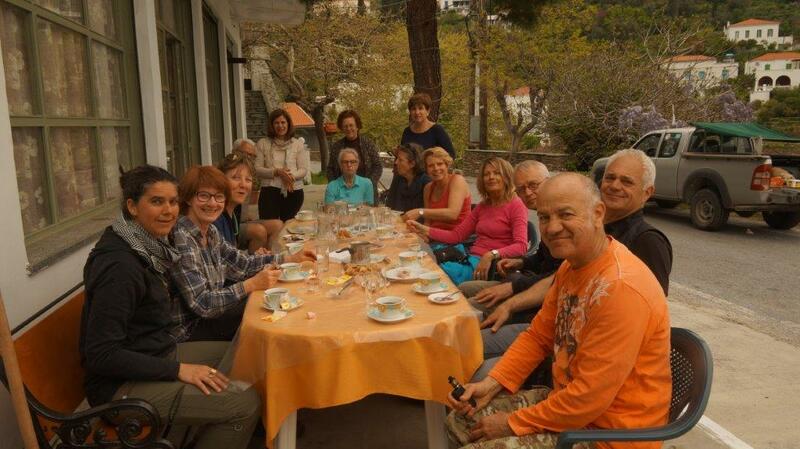 The Cultural Association of Menites and its Board members Despina Hatzoglou, Katerina Vareli, and Eleni Papadopoulou who graciously welcomed our Dutch friends to the Association’s premises offering coffee, tea, and pastries. 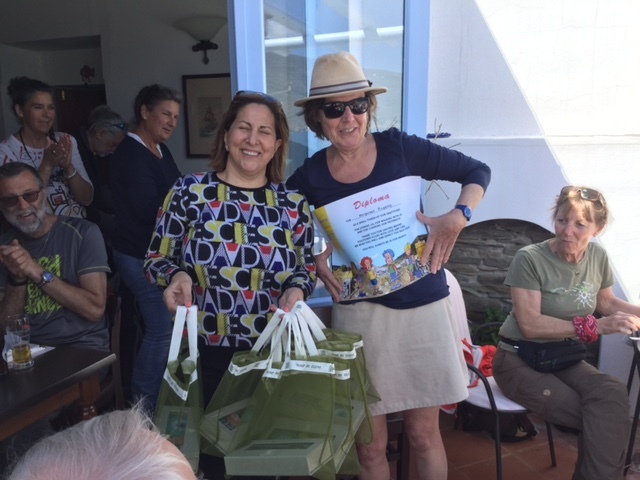 Popi Regoukou of Stella Pension who donated snacks for the volunteers on their second day of work in Chora while she also helped with the volunteers’ transportation, as did Erietta Papaioannou and Panos Georgriou. 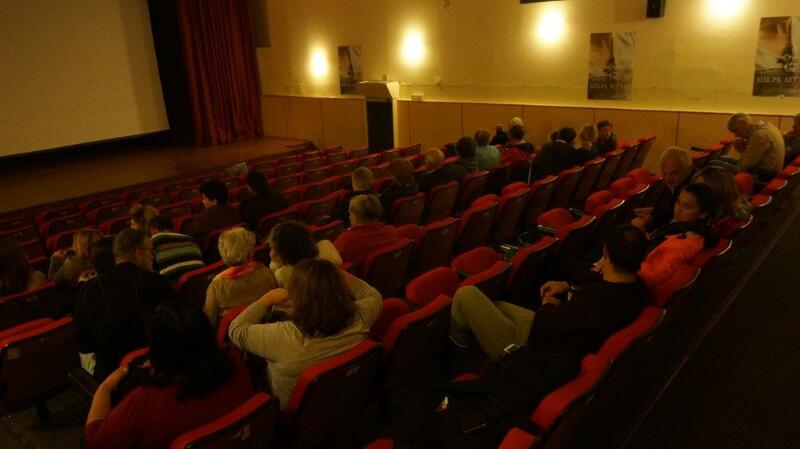 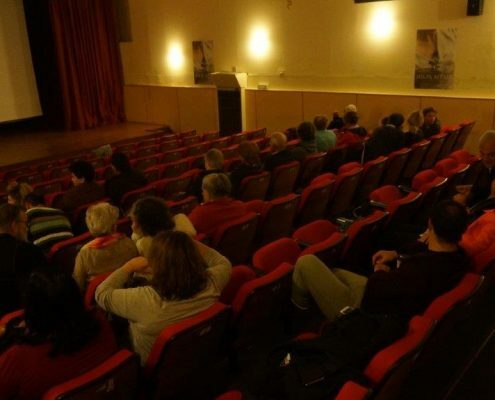 Mikra Anglia S.A. who allowed the viewing of the film by the same title and the Film Club of Andros where the film was viewed by the volunteers on their second day of work in Chora. 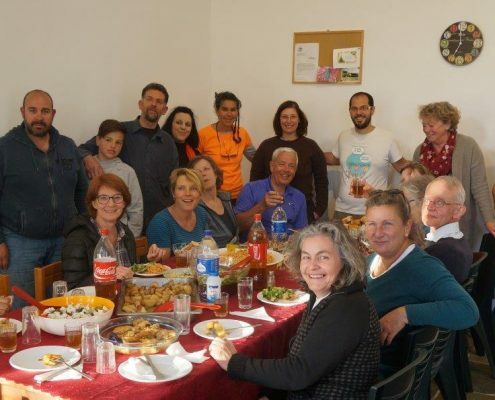 The Panachrandou Monastery, senior monk Evdokimos, father Aetios and the younger Evdokimos who offered the volunteers a guided tour of the monastery and treated them to coffee and local sweets. 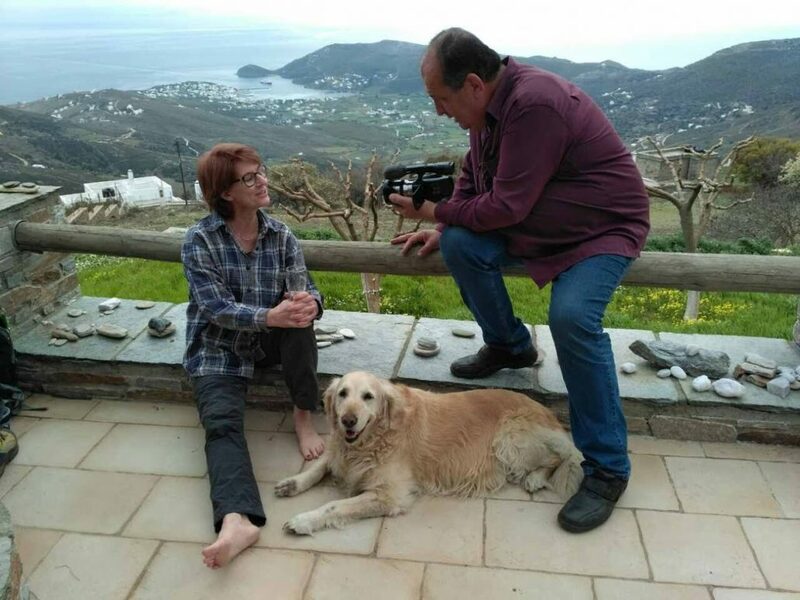 Throughout this amazing journey, our friend, the heart and soul of the Andros Film Club, Vangelis Loukisas with his camera, his drone, and Perla…took pictures of us, made videos of us, spoke to the people in the villages as they all know him, carried us and our tools innumerable times and spread his positive and creative spirit all around us…We are grateful to him and so admire him! 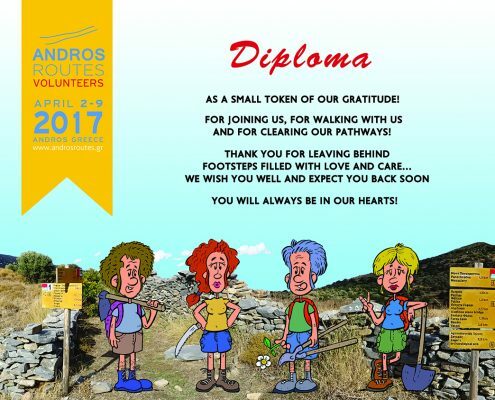 Our friend and fervent supporter of our efforts Achilles Klisouras drew a special commemorative diploma depicting the volunteers working on the trails of Andros and used calligraphy to record each volunteer’s name on a diploma. 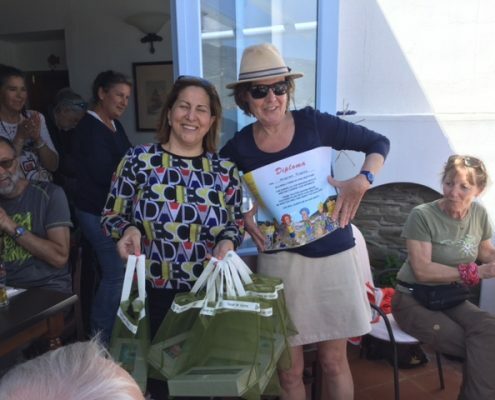 They were all awarded to our Dutch friends during the closing ceremony. 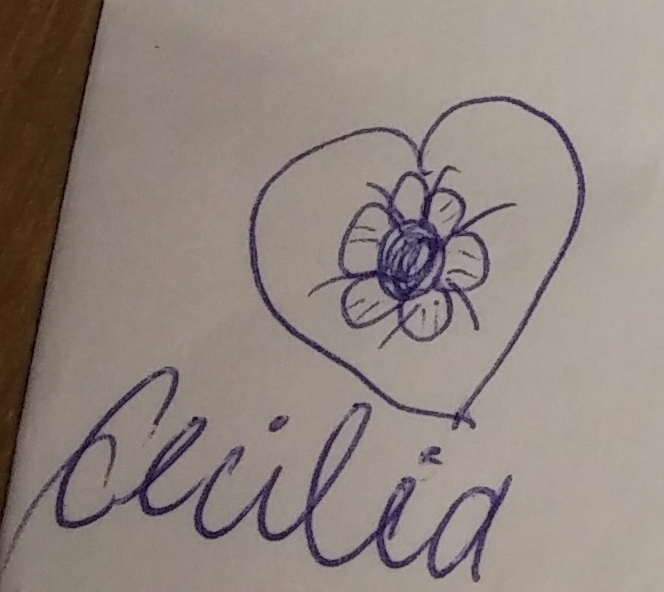 Kudos to the artist!